The Holy Spirit: Do We Make Waves, or Ride Waves? I just finished watching Francis Chan’s lesson on the Holy Spirit via the free Basic Series preview I told you about yesterday. I first ran across this teaching from Rick Warren years ago in his book The Purpose Driven Church. Rick basically says near the beginning of that book, “If you want your church to make an impact, find out where God is already moving in your community and join in. 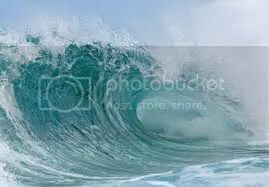 Ride the wave, because you can’t create waves of divine activity just like you can’t create waves in the ocean.” I’ve since heard this teaching repeated by a number of preachers at lectureships and leadership gatherings continuing through this present instance with Chan. That’s disappointing, because I have an inherent problem with this illustration and teaching, and believe you should too. Here’s why: a great truth revealed through scripture is that things happen when God’s people pray. When the Holy Spirit first appeared in Acts 2, what were the believers gathered together doing? Leading up to that time, Acts 1:14 says the believers “joined together constantly in prayer” – prayer was their main activity. Did Jesus tell them earlier to wait on the Counselor to come? Yes. Would He have come if they hadn’t been praying? Probably so, but I find it interesting He shows up in the middle of their prayer meeting, and believe we would do well to note the connection. The story continues, and after the outpouring of the Holy Spirit and the baptism of thousands, prayer was one of several things the people “devoted” themselves to every day. In Acts 6, the apostles delegated the work of caring for Grecian widows to others so they could “give their attention to prayer”, in Acts 10 the first Gentile convert was made so because “God heard his prayer,” and Acts keeps going like that – there are many other examples I could cite from that book alone. And what about the rest of scripture? Were you aware that the apostle Paul’s number one request to churches he corresponded with was that they pray for his evangelistic work to be effective? Why? Because Paul understood prayer moves the Spirit to touch the hearts of men and women – to prepare them to decide to enter into new life with Christ. And what about the prayer life of Jesus and the things He associated with it? What about the enormous number of Old Testament stories involving massive moves of God specifically due to prayer – sometimes a single person’s prayer at that? I could keep going, but I think you get the point. Were massive waves of Holy Spirit activity present in the life of the early church? You bet there were. But what were these waves of the Spirit in Acts always accompanied by? Prayer. Heartfelt, genuine, God-moving prayer. I can tell you many stories about souls Airiel and I have prayed for who came to Christ, I believe, specifically because we prayed earnestly and consistently for them – that the Spirit would move and touch their hearts. God answered those prayers, and this has been repeated over and over in our ministry. Those that know my story are aware I was a pretty rough character when I was younger. Want to know when my heart began to change? When my parents requested a group of disciples get together and spend time praying specifically for me. Things began happening in my life almost to the day that led to my eventual conversion, and I didn’t even know anyone had been praying for me until later. That being said, when a person says something like, “We don’t make waves of the Spirit, we just ride them,” they’re putting on display, for the world to see, a shallow theology of prayer. Prayer is not just something Christians practice because it’s what Christians practice – prayer is a weapon against the dark spiritual forces that surround us. And the Holy Spirit doesn’t just guide our path, He is also a weapon who revels in bringing light to dark places – He loves it! That’s why He’s here – to assist us in this ongoing war against the darkness! Speaking of that, there’s a battle scene in one of the Lord of the Rings movies (I forget which) in which the wizard Gandalf appears with a group of mounted soldiers riding down a hill, weapons raised, toward the goblin army. His staff, held high above his head, suddenly begins to emit a great light that not only illuminates the battlefield, but is also used as a weapon against the enemy. That’s what the Holy Spirit is like. He illuminates, nudges, leads, guides, but not just that. He’s also a warrior adept at destroying the strongholds of Satan. He moves before us, shining brilliantly, but not just to illuminate. He moves before us through prayer, I believe primarily, to fight. While it’s true that in some respects we’re just along for the ride on this journey, make no mistake: we are allowed to give input as to the direction and focus of divine activity along the way. And that’s why prayer is so powerful, because prayer is our way of having a say. Prayer moves the Spirit, therefore, prayer is dangerous. When have you witnessed prayer “create a wave” of the Spirit that had amazing consequences? Wes, I don’t think the two ideas are in opposition. By praying, we are already surrendering our agency in order to accept God’s. We recognize that although we may act, God is the only one who has the power to change hearts; and further, we ask him to act, and we surrender our will to conform to what HE is doing. Wouldn’t it be a little bit arrogant to always assume that our will lines up perfectly with God’s will? The first thing I thought of when I read your post was the parable of the unjust judge who granted the request of a lowly widow just because of her persistence. Then there’s the verse when Jesus says, “Ask and it will be given to you; seek and you will find; knock and the door will be opened to you.” It’s an extremely powerful concept to know that the God of the universe acts on the prayers of humanity. However, we follow God, not the other way around. If we thought that God followed us, we would have doctrines that do not align with Scripture, as many do—and there are some theologies in which you can “summon” angels or “command” God to work a miracle. I think Chan’s point was not that prayer does not bring about agency, but simply that God’s thoughts and ways are higher than ours (Isaiah 55:9), and that we always have to remember that when we pray for the Holy Spirit to act. I’m also thinking of Galatians 5:25, even though it is more of a warning: “Since we live by the Spirit, let us keep in step with the Spirit,” and John 3:8 where Jesus tells Nicodemus, “The wind blows wherever it pleases. You hear its sound, but you cannot tell where it comes from or where it is going. So it is with everyone born of the Spirit.” I admit that there’s probably a stronger argument in the first set of scriptures than in these, which may not be as related. My experiences have been that it is better to ride the waves as I recognize them rather than try to create my own with prayer and great intentions. Wow, that was long, sorry. Just kidding … you make some great points actually. I did not mean in any way to imply that God follows us, only that God divinely works through us in prayer. There’s a supernatural aspect to bringing requests before God that I believe one neglects when they say “we can’t create waves – we just ride them.” Technically God is the only one who creates the waves, but often He creates them because people specifically ask Him to (you ought to read the book When God Walked on Campus if you haven’t already). I know that you didn’t imply that. However, I have heard televangelists do this, so I was merely illustrating an extreme that exists in some theologies. I haven’t read “When God Walked on Campus” yet, but I need to—I haven’t even finished “UnChristian”! When God Walked On Campus is a book about the great spiritual revivals that have taken place in the past 200 years or so, and traces the beginning of each to groups of people – college students no less – getting together to pray for an outpouring of God’s Spirit. Did you know that every great spiritual awakening that has taken place in the history of the United States started on a college campus with students praying for God to act? Actually,… we can make waves. I was watching PBS the other day, a special about the history of the arms race in the cold war. (funny, I didn’t plan on watching it, TV was just tuned there because I had the DVR previously set to record the American Experience episode on the freedom riders, but it plays in such that I can make a point here) I started watching at a point where they were discussing the testing of the H-bomb and how badly they had miscalculated. Instead of the safe zone being 20 miles out, it should have been more like 26. The navy men 23 miles away, facing the other direction with goggles on, saw thru their skin to the bone after the initial flash. And, to your point about waves, a massive tidal wave was created. So we CAN make waves… And the people just out there riding the waves, who is to say the wave they are riding is actually a good thing? Wes, I really appreciate how you don’t just jump on band wagons but think things thru. I predict a long frustrating career for you — frustrating in that you have to do things the hard way, not the easy / popular way. But sticking to what’s right will ultimately be quite fulfilling tho, in knowing that you’ve led people along the narrow way, difficult tho it be. Doesn’t Scripture talk about • working • out our salvation? Too many don’t want to put the work in. Good point, G, about not all waves necessarily being good, and thanks for the encouragement. Look forward to seeing you this summer at the campus ministry workshop – you’re still coming, right? Love that you posted this encouragement to pray. It is certainly true that God has plans that he will enact on his own. But it is also true that we are able to move mountains and we get that started by prayer. Great examples from scripture. Interesting to see the spread of that false idea that we can’t make spiritual waves. We need to be careful about accepting what is said simply because it is in a popular book/lecture/etc. I really enjoyed your post and really enjoy Chan’s videos. Thank you for posting both. I believe God moves in “mysterous” ways. Does He move as a result of prayer? Yes. Does He move on His own without prayer? Yes. He moves in ways we do not understand. But having said all that…Allow me to echo that Prayer is POWERFUL and we should include it in ALL situations. To say “we don’t make waves of the Spirit” downplays the powewr of prayer! Thanks for the comment, Lynn – glad you agree. I have to agree mostly with Wes on this one. To me, it seems dangerous to just ride waves. Who’s to say these waves are guided by the Spirit? The man in Gainesville who wanted to hold a massive Quran burning was certainly creating a wave. The people who protest soldiers’ funerals are definitely creating waves. Even if we see a wave, we need to seriously try to discern whether it is Spirit lead before we ride it. An important part of this discernment process is PRAYER. The idea that we can’t make waves also seems partly like an excuse not to do hard evangelistic work. We need to pray and work hardest when the sea is flat and motionless, and I know this from personal experience. Before Adam Farnsworth came to AFC in Tallahassee, things were pretty bleak. Many of us in the group felt bitter and exhausted. Hope in the possibility of an effective group was small and ever dwindling. However, with Adam’s leadership and hard work, we made ourselves vessels for the Spirit to work through, and we created a wave. Now we are striving and praying to keep it moving. Adam and Crystal are AWESOME servants of our Great God! And Daniel, your in for a great ride…enjoy it. I love your group! It is the part of your mind the part of your Spirit that is joined with the Mind of God. The Holy Spirit is the Voice for God and acts as a reminder to all of Gods children of the that God has for them.. God loves His children so much that He wanted His children to always know that they are safe they are loved and they are whole.